CarSoup.com is a leading Web site for buying and selling automobiles. Founded in 1998, CarSoup provides users with comprehensive information on new and used cars, as well as motorcycles, ATV’s, personal watercrafts and snowmobiles. Currently operating in 14 states, and ranked among the top 15 Minnesota e-commerce companies, CarSoup offers a user-friendly car buying environment with the largest selection of local vehicles and dealers online today. 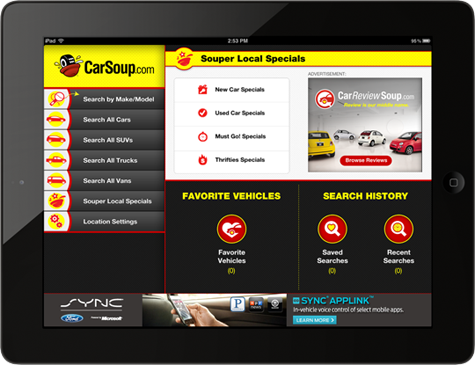 The Carsoup iPad app provides a robust car shopping experience for a commercial user base. With a sleek and thoroughly state of the art interface, the Carsoup app employs Geocoded vehicle data, enabling searching by location. An App made for the iPad which provides a truly stunning auto shopping experience. A big, beautiful, colorful, full-screen app that leverages iOS technology inside the iPad. Download the app for yourself and start browsing over 27,500 new and used cars today.